Are you looking for a way to improve your sales, increase employee satisfaction, and improve the overall perception of your business? If you answered yes to any or all of those questions, then you’re in the majority. Most businesses are always looking for ways to better their business. What if we told you that it all starts with how well you maintain your parking lot? That’s right – parking lot sweeping can help your business improve. From happier employees to clients who are given the right impression from the moment they arrive at your address, parking lot sweeping hosts a variety of benefits for you and everyone tied to your company. And it all starts with our technicians at Universal Site Services. We offer professional parking lot sweeping in Roseville, California – and we do it at a great price and with flexible scheduling. Take the first step in improving your business and engaging more customers. 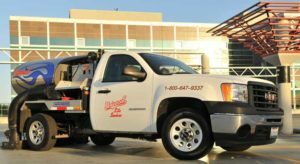 Pick up the phone and call Universal Site Services today for parking lot sweeping in Roseville, CA. Fewer tripping hazards – potholes, oil slicks, gravel, and other debris pose serious fall risks. You don’t want an employee or client tripping in the parking lot or getting a flat tire because of a huge pothole. Parking lot sweeping helps to alleviate these issues at the root. Put your best foot forward – by having a clean, well-manicured parking lot, you present the best possible first impression to your new (and current) clientele. Deter crime – if a potential vandal sees that your property is well maintained, they are less likely to damage or deface your building, too. Deter littering – if one person sees litter in the parking lot, it only encourages them to do the same. Our sweepers remove litter and prevent it from becoming a recurring issue. Universal Site Services uses environmentally friendly parking lot sweepers. How do we manage to do that? Our sweepers help the environment by picking up dirt and debris that would otherwise make its way into the air, and also by whisking away oil, spilled gas, and other chemicals that would get into the water supply via the storm drain. Our sweepers also use state of the art non-polluting technology, and every one of our vehicles employs fuel-efficient technology in order to reduce negative impacts on the environment. We also pick up litter every time we sweep your lot, preventing it from being picked up by birds or getting blown into the natural habitat. 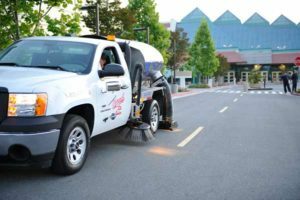 If you want to do something good for your company and for the environment too, then you need to call us today for parking lot sweeping in Roseville. We can sweep any and all spaces, so long as you give us a time and a place! We can sweep up your parking lot before and after a special event, too. Just give us a call today to discuss options and pricing.